Not content to coast into 2017, Amazon just kicked off its first ever Digital Day, with tons of deals on, you guessed it, digital downloads. There’s too much stuff to possibly list here, but a few of our favorites are below. Inside, you’ll find deals on albums, games, software, ebooks, digital subscriptions…if you can download it, it’s probably on sale. I don’t suppose these deals are at risk of selling out, but they are only available today, so take a few minutes and buy yourself something nice. I don’t know how else to say it, but we’re all pooping incorrectly. Originally popularized by Squatty Potty, a toilet stool can lift your legs into ideal bowel movement positioning, and you can get one from easyGopro for $19 today, or a few bucks less than the Squatty Potty. If you need to be surrounded by opulence while you do your business, the Squatty Potty teak is on sale for $60 as well, plus $4 shipping. 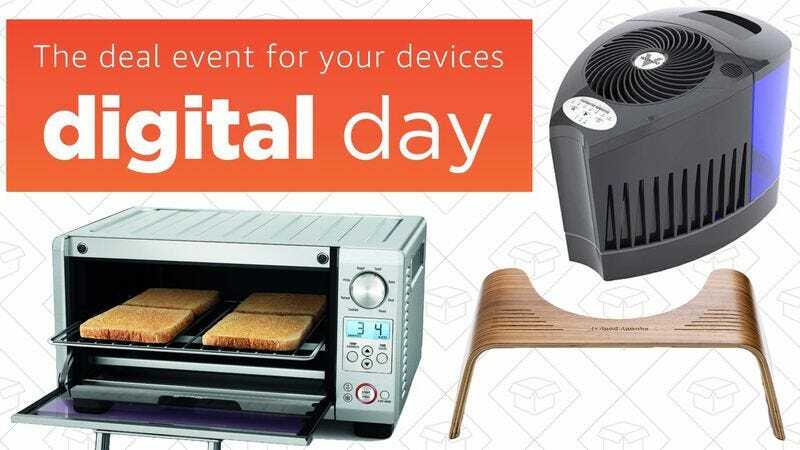 Breville’s reader-favorite Smart Ovens almost never go on sale, but Amazon’s offering rare discounts today on two different models today, including an all-time low price on the Mini. Unless you happen to own some other beautiful Breville products we recommend, it’ll almost certainly be the best-looking appliance in your kitchen. I got one of these as a wedding gift several months ago, and it’s every bit as good as advertised. The Mini is just $100, down from its usual $150, and the 800XL is also $50 off, down to $200. If you got some Amazon gift cards for the holidays, I can’t think of many more worthwhile things to spend them on. If dry winter air is wreaking havoc on your sinuses, you can fight back with Amazon’s one-day humidifier sale. Inside, you’ll find four different countertop humidifiers starting at just $20 each. Just remember that these prices are only available today, so lock in your order before the deals evaporate. If you’ve been itching to get yourself a mechanical keyboard, this 104 key model from Aukey includes RGB backlighting, and ultra-clicky blue switches. For the rest of Friday’s best deals, be sure to head over to Kinja Deals.